The CareDirector team are just back from the ISM Conference in Phoenix, Arizona. We had some great meetings with state agencies who had lots of questions about becoming CCWIS compliant and what systems they would choose that would future proof their solution. It really opened up some great conversations about our experience in this area across the US and the UK and allowed us to demo our new Child Welfare COTS solution. Some modules may lie outside CCWIS and may not be available for cost allocation (e.g. county administered) but States should do what meets their needs. The Bureau emphasized that states should plan on providing a checklist for the Advanced Planning Document (ADP) in the near future, which states need to submit to demonstrate intent to convert to a CCWIS. These takeaways still left some attendees unsure of the direction to take but we gladly discussed this with them as we have extensive knowledge in this area. Some routes are more suitable for smaller states and some for bigger states and a lot has to do with the budget available and what needs to be achieved and when. We will continue to post more information on this so keep an eye on our site but we would also welcome any questions you have and you can submit them here. 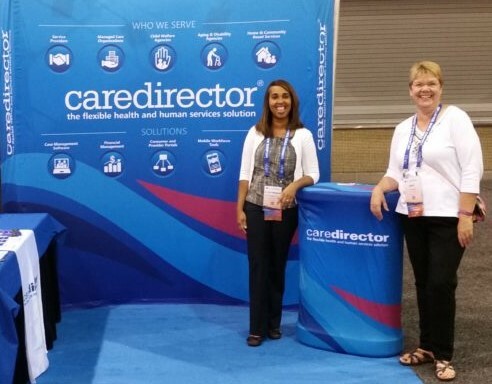 It was a great conference and CareDirector was delighted to be a part of ISM 2016!!! We are already looking forward to the 50th anniversary next year in DC! It was a great conference and CareDirector was delighted at the chance to be a part of ISM 2016!!! We are already looking forward to the 50th anniversary next year in DC!